Artibat Rennes 2016 : Rennes, France - Kobelco Construction Machinery Europe B.V.
ADDITIONAL INFO: Artibat is a top show for building and public works and associated trades. Everybody from the West of France involved in construction converges on the show looking for the most innovative and best performing solutions, discovering an ever-growing range of products, and holding exchanges with manufacturers and distributors of equipment and products. On the whole the organisers welcomed on the 3 days of the fair, from 22. October to 24. 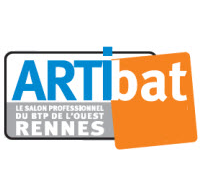 October 2014, about 1006 exhibitors and 39184 visitors on the Artibat in Rennes. The 15th Artibat takes place on 3 days from Wed., 19.10.2016 to Fri., 21.10.2016 in Rennes.